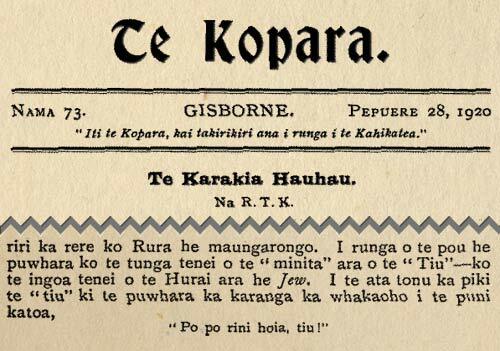 This article in Te Kopara by Rēweti Kōhere in 1920 described those who followed the Pai Mārire religion, who, like other Māori prophetic movements, saw themselves as Jews (Tiu or Hūrai) or Israelites (Iharaira). 'Kua kiia ake ra e au he Hurai te "tiu" no te mea i runga i te ki a te Pikopo nona te hahi matua ka mea te hauhau ko to ratou na "minita" he 'tiu" ara he Hurai no te Hurai hoki te hahi tino matua.' – I have described the 'tiu' as Israelites because when the Bishop said the main church the hauhau called their 'minister' a 'Jew' that is Jewish, it was because their faith was drawn from the Jewish faith.